We've been opened international shipping service. We will send you a mail for the information, you can also check it out at “My page". 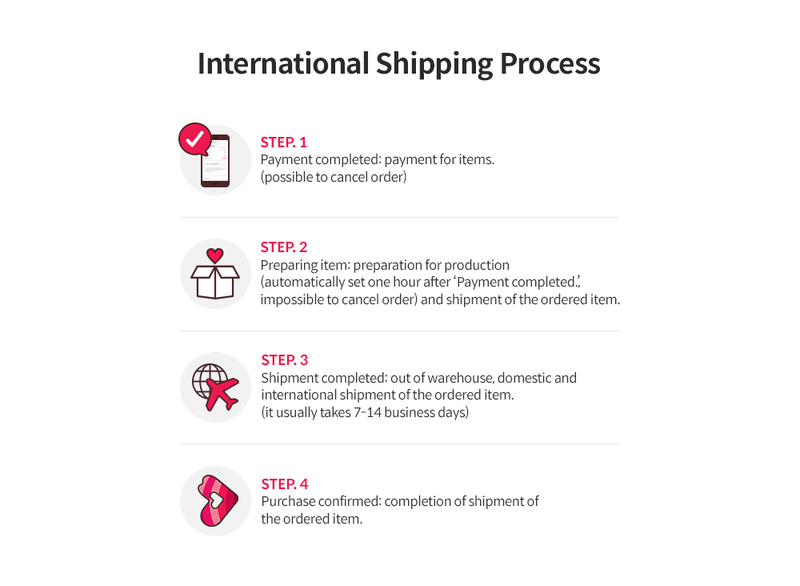 - Shipping fees are set with automatic payment methods depending on destination country and weight of ordered items and added to the total amount of payment. - Customs, duties, and taxes are not included in the shipping cost. - The buyer(recipient) shall bear all other costs such as duties, taxes, and any other charges related to clearing customs which might be levied in your country. - Consult with the local Post office or Customs for more detailed Duties information. - Re-shipment or refund is not allowed. If you have any questions, please read "FAQ" first. You will receive answers in a short time. ※ Answers are given to questions in the order listed and it may be subject to delay. ※ Please Write in Korean or English Only.